Status: Open to public. In various stages (planning, in progress or complete) depending on lake. 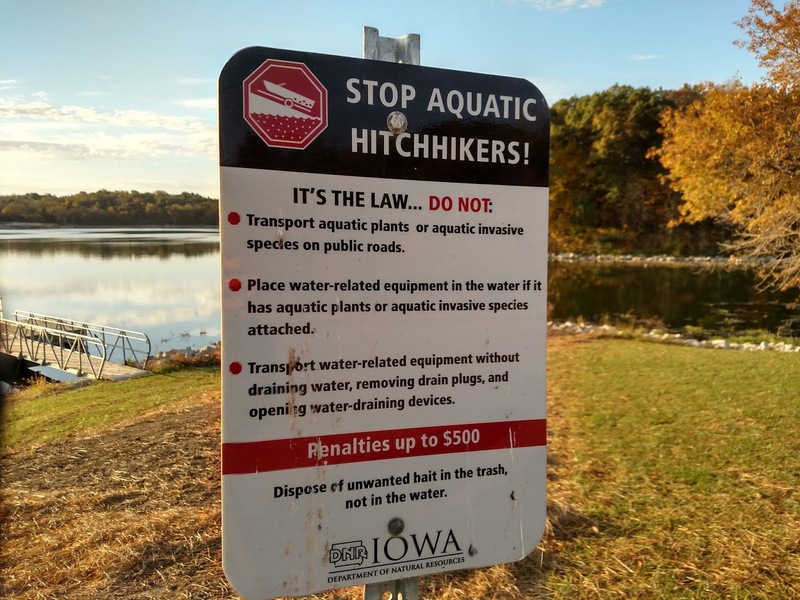 Iowan households take nearly 12 million trips to Iowa's lakes each year, according to a 2009 survey. These trips generate $1.6 billion in spending. Environmentalism aside for a moment, even an economist can see the value in having healthy aquatic eccosystems. 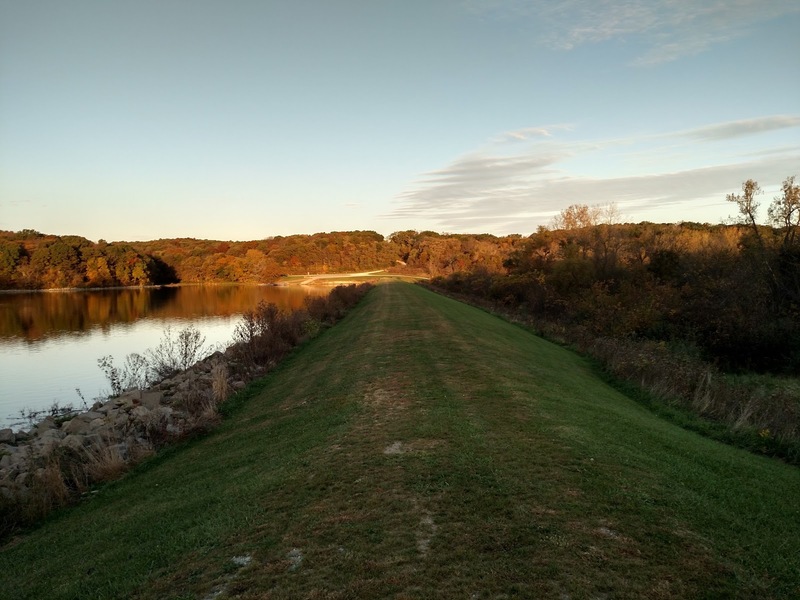 It's also safe to say that Iowa's Lake Restoration Program (LRP)—with it's annual budget of around $6 to 8 million since it began in 2006—has been a wise investment. It's a necessary one too. Since monitoring began in the 70's, the health of Iowa's lakes had been in serious decline—nutrient and silt runoff spoiled water quality, fish populations stagnated. 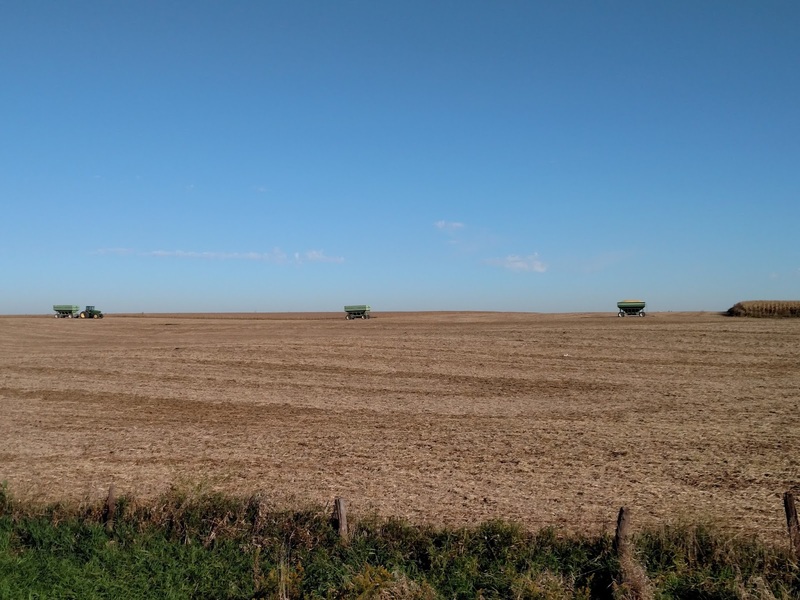 For those familiar with the erosion that agriculture can potentially cause, this should come as no surprise in such an agricultural state as Iowa. 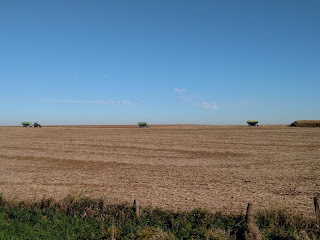 68% of Iowa's surface area is plowed; another 28.3% is either grazed, logged or built upon; and only 3.3% is protected. The remaining 1.3% is water—the state's relative low spots and therefore the recipients of said erosion. 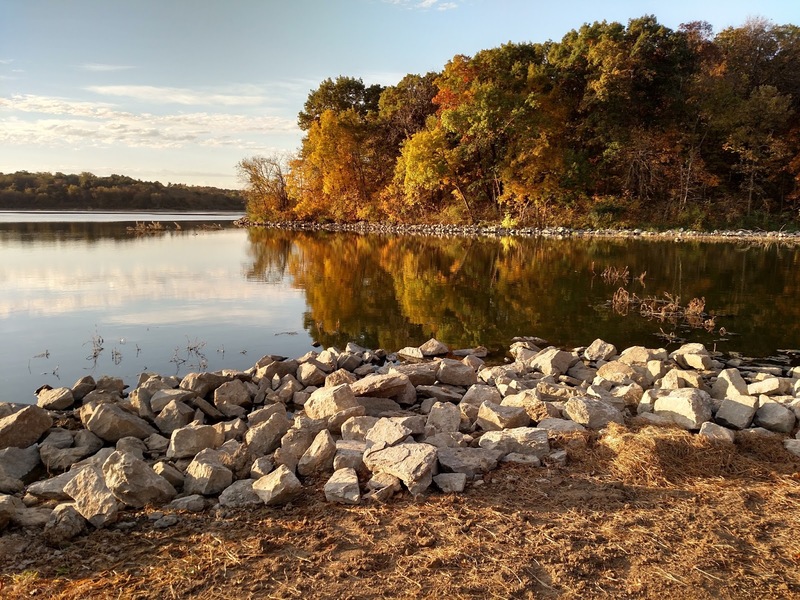 Successful lake restoration projects will improve lake water quality and recreational opportunities, contribute to community development efforts and make Iowa a better place to live and work. 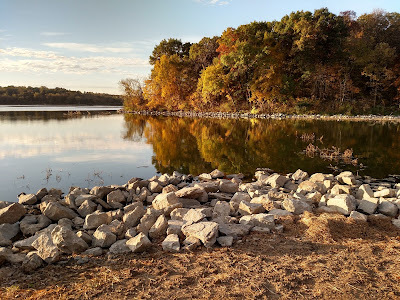 In this article we'll more closely explore how Iowa's lakes are being restored. 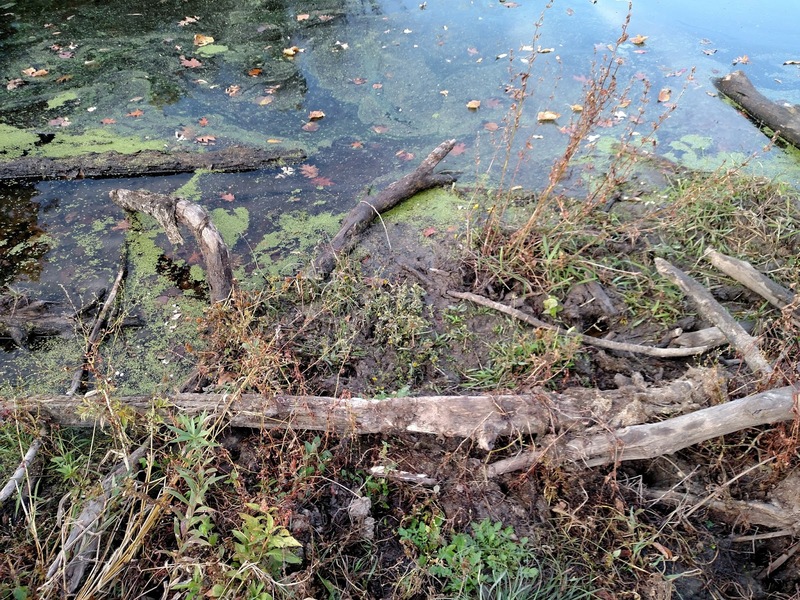 To do this let's visit an example—Lake Miami in Monroe County—that had severe problems with erosion as well as invasive carp. We'll examine their specific techniques for erosion control. We'll also speak with a fisheries technician for a graphic account of how they "renovated" the fish population. Formed in 1961 following construction of the dam. 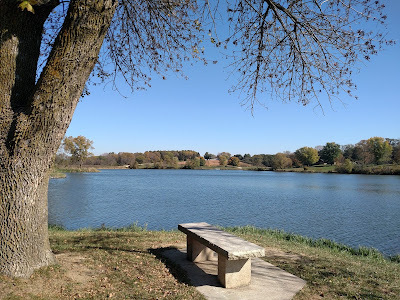 Iowa DNR and the Monroe County Conservation Board assume joint management of the Lake (137 acres) and surrounding Miami Wildlife Area (776 acre total). 2012 LRP report: Lake Miami received $17,000 in funding for a watershed assessment. The report also identifies the problem of invasive carp, estimated at 400lb/acre, and the decline in “gamefish” biomass. 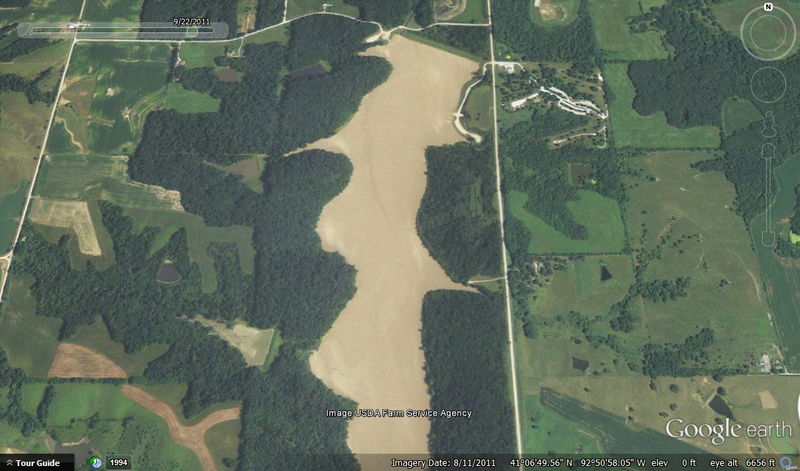 2013 LRP report: According to the watershed assessment, 4,111.7 tons of silt are deposited in Lake Miami per year. 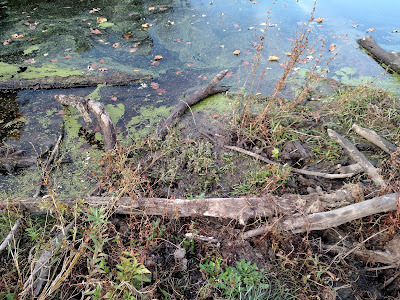 Water colored by sedimentation following a storm in 2011. First, 786.97 tons/year come from the lake's shorelines. 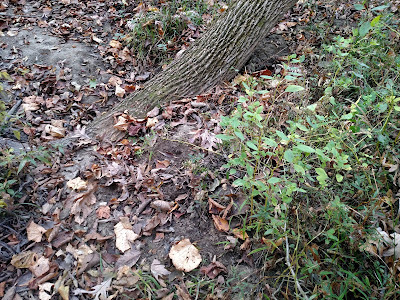 Wave action, as well as the rising and falling of water levels over time, chipped away at the banks. (We've seen this same "sloshing action" deposit 189-thousand tons of silt in a reservoir in PA over its 70-year lifespan.) 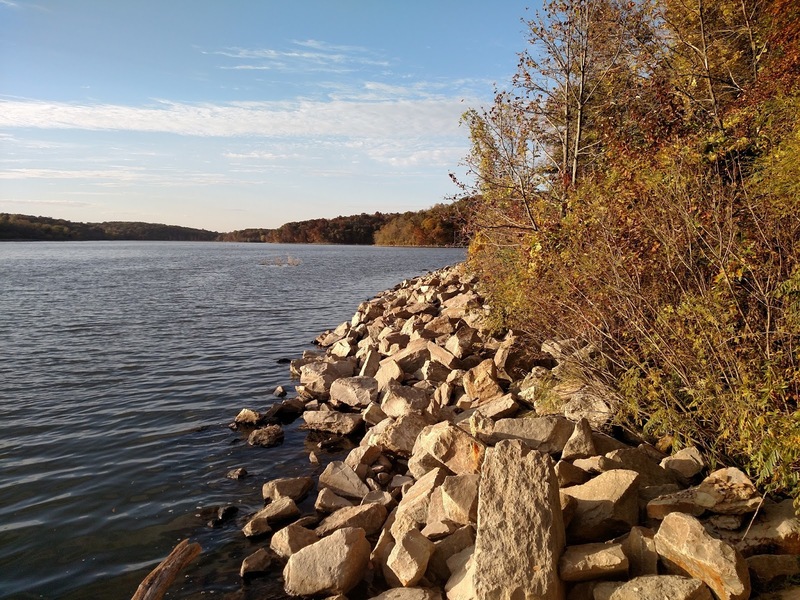 The solution is to stabilize the shoreline, 10,000 feet in total, by grading it and adding large boulders known as rip-rap (like we've seen stabilize a creek in Ontario). The second and largest source is runoff from throughout the lake's watershed, 3,324.79 tons of silt per year. 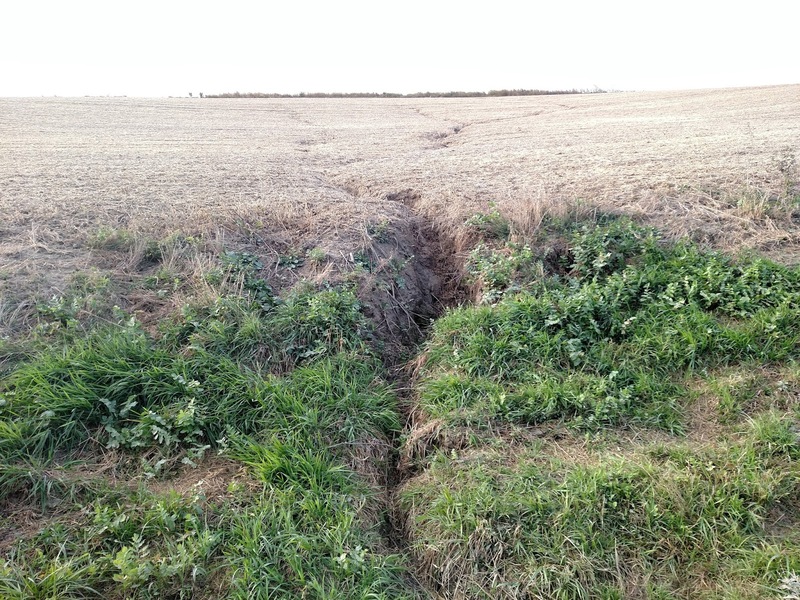 The erosion can still be seen with a quick tour around the nearby farmlands. The solution here, in general, is to slow or halt the flow of rainwater across the landscape. The DNR's suggests plenty of methods (see list below). 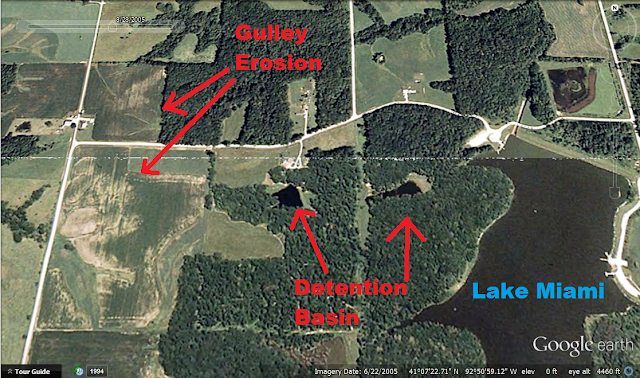 In the case of Lake Miami, four new ponds and two dry basins were recently constructed, in addition to the several detention basins already present. The DNR also hopes to continue "working with private landowners to reduce the impacts of watershed land use on water quality," according to the DNR's blog post on this lake. Removing invasive carp was another problem at Lake Miami. DNR fisheries biologists took extreme measures, which some background on the problem might help to clarify. Fish farms first imported Asian carp in the 1970's to control plankton. Soon after they escaped into the Mississippi River. These carp reproduce rapidly, grow quickly up to 110lbs, consume 40% of their weight in plants or 20% of their weight in plankton daily (depending on the species). They dominate American waterways, displacing native fish populations. This threatens commercial and recreational fishing, both multi-billion dollar industries. The ecological damage is also severe, with loss of biodiversity and imbalance of tropic structures. Carp also exacerbate the water quality problems mentioned above; their rooting actions on the lake bottom re-suspend (i.e. 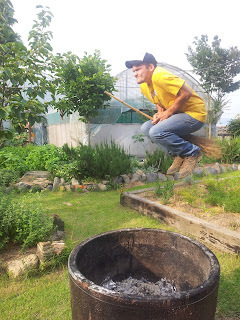 stir) sediment. That's why the Iowa DNR needed to “renovate the fish population,” as the DNR blog post claims. However, I found that description to be a tad.... nondescript—a bit watered-down. So I spoke with Bruce, a DNR fisheries technician for a more informative, albeit more graphic, explanation. In October of 2013, they opened the drains, lowered the water level, and added a chemical called rotenone, which interferes with fishes' oxygen intake. The entire fish population of the 137-acre lake suffocated, floated to the surface and was left to decompose naturally. The chemical has no effect on frogs or turtles or other aquatic species, and is soon broken down by sunlight (photodegrades). With a clean slate and the invasive “carp problem” eliminated, the DNR fisheries restocked with native species such as bass and catfish. 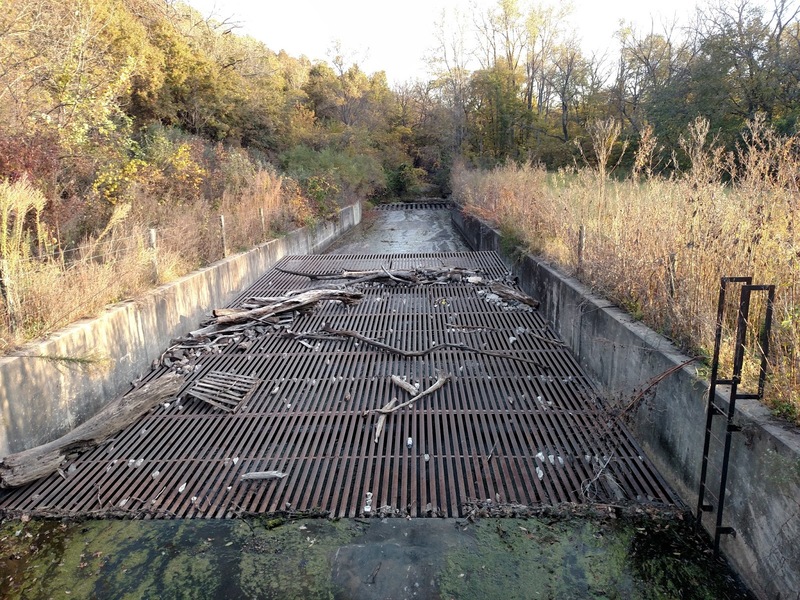 To prevent carp from reentering, the DNR constructed a barrier across the dam's outlet spillway. 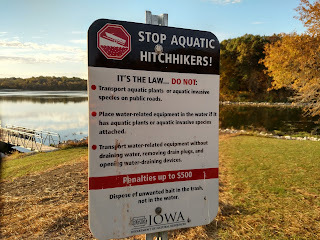 They also enforces laws against transportation of aquatic species.